Qamishli, Syria: Hundreds of miles away from family and friends facing an attack by Turkey, Kurdish and Arab forces deployed in the eastern Syrian desert against militants have become increasingly frustrated. Six weeks into a Turkey-led assault on the rebel enclave of Afrin, young men and women are leaving the fight against Daesh in droves to head west to help. Kurdish militia have formed the backbone of the Syrian Democratic Forces (SDF), an alliance that has successfully expelled Daesh from much of Syria with the backing of a US-led military coalition. But as news of the battle in Afrin reaches them, the fighters have become reluctant to hunt down militants in their last hideouts in Deir Al Zor province. 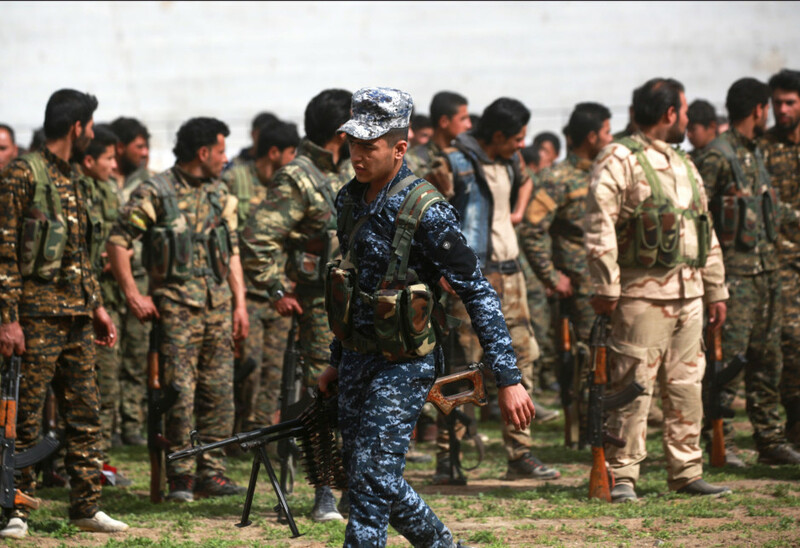 “We’re preparing to head to Afrin,” SDF fighter Roshavam Qamishlo told AFP on Saturday. The enclave “needs us now more than ever”. He spoke at the funeral of three comrades-in-arms in the northeastern town of Qamishli, where dozens came to pay their respects to those killed in Deir Al Zor. “They should have died in Afrin,” he said, as their coffins were displayed in the middle of the crowd, draped in the Kurdish colours of yellow, red and green. Arab fighters, too, have opted to ditch battlefronts against Daesh to shore up lines of defence in Afrin. On Tuesday, SDF commander Abu Omar Al Idlibi said 1,700 of his fighters - mostly Arabs from northern Syria whose families had sought refuge in Afrin - would be sent to defend the enclave in the coming week. Afrin, which is controlled by the Kurdish People’s Protection Units (YPG) militia, is one of three regions Syria’s Kurds hope will be part of a self-ruled federal region in the country’s north. Turkey sees the YPG as a “terrorist” group and has bombarded the region with air strikes and artillery fire since January 20. More than 170 civilians have died in the assault, says the Syrian Observatory for Human Rights, a Britain-based monitor. Ankara however denies the claim and says it takes the “utmost care” to avoid civilian casualties. The offensive has prompted a call-to-arms for the YPG and SDF, and one senior SDF official says “hundreds of fighters from Afrin and who have relatives there have returned to defend” their people. As a result, the US-led coalition declared an “operational pause” to its anti-Daesh fight in east Syria on Monday. US and coalition officials have said they will not get involved in the Afrin fighting and expressed concern it would detract from the SDF’s operations against Daesh. In addition to reinforcements from Daesh battlefronts, other fighters have streamed into Afrin from Qamishli, Hasakeh in the northeast and Kobani further west, says Rezan Hedo, an adviser to the YPG in Afrin. Others even travelled from the Kurdish neighbourhood of Sheikh Maqsud in the northern city of Aleppo, Hedo tells AFP. In Qamishli, another fighter who gave his nom de guerre as Nushin Qamishlo said he would also join the fight on the Turkish border. “We all want to go,” said the 25-year-old, who sported a thick beard and whose head was wrapped in a bright blue scarf. Fighter Al Ashqar Nuseen feared losing Afrin could be a huge blow to his long-awaited dreams of a federal Syrian Kurdish region. “We will defend Afrin with all our might, taking on the Turks like we did Daesh,” he said. Ali Omar, 65, a Syrian Kurdish bystander at the funeral in Qamishli, said he supported the Kurdish fighters withdrawing from Deir Al Zor. “When it’s our interests, our people, our villages and our towns that are threatened, we’re forced to leave everything and head to defend our homeland,” he said. But he questioned why the US-led coalition, which the Kurds have aided in their fight against Daesh in Syria, had not intervened to help the Kurds in Afrin. Without help from any outside power, Syria’s Kurds have found themselves in the awkward position of having to ask for support from the Damascus regime. Since last month, pro-regime fighters have been deployed alongside Kurdish fighters in Afrin on several fronts. Abdul Salam Ahmad, a high-ranking official of the Kurdish Democratic Society Movement, said Syria’s Kurds have lost faith in the international community. “This region will not find stability until a fair solution is found for the Kurdish people,” he said.